When are Wire Mesh Baskets Best? 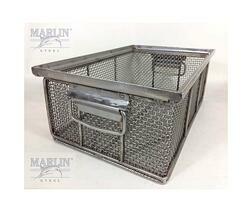 The question “when are wire mesh baskets best?” is one that customers ask Marlin Steel’s engineers very often. As an experienced metal fabrication company, Marlin Steel often manufactures custom basket made from wire mesh and from sheet metal components for a variety of applications. As such, Marlin Steel’s engineers have extensive experience in adjusting designs to best meet the needs of the customer. However, in order to answer our title question, let’s look at the characteristics and advantages of wire baskets in comparison to sheet metal baskets. One characteristic that defines a wire basket is the amount of open space in it. With a wire mesh basket, the individual wires that form the mesh can be spaced as far apart as needed to make it easier for the cleaning medium in your wash processes to reach the parts to be washed, and then drain away afterwards. This is especially useful for aqueous wash processes and vapor degreasing, where making sure that runoff gets clear of the parts being washed efficiently is just as important as the structural integrity of the cleaning baskets. On average, wire baskets are slightly lighter than their sheet metal counterparts, but also tend to a lower tensile strength to match. 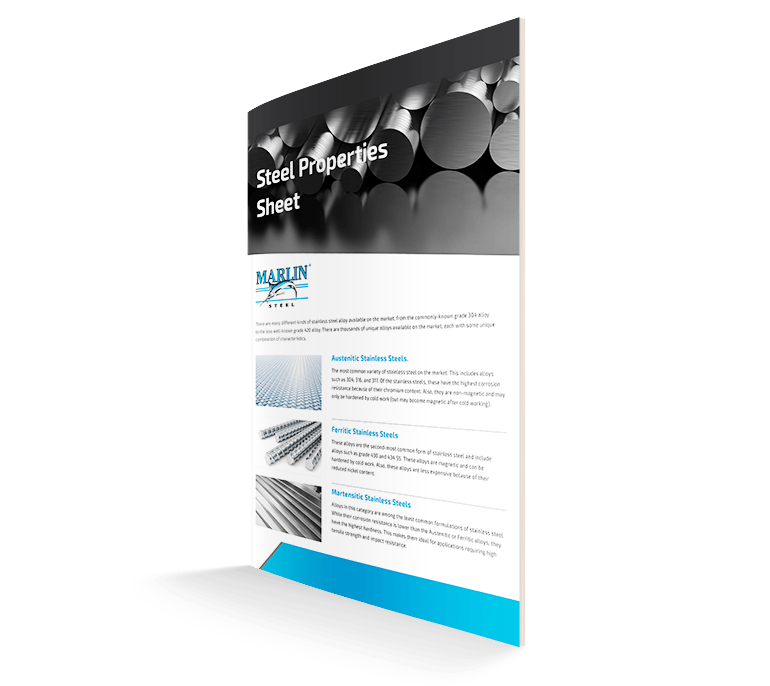 This means that, when your parts loads are light and extra weight could affect the smooth operation of your cleaning or parts finishing machinery, the wire mesh basket might be more desirable for your application. However, thicker pieces of sheet metal will generally hold up better under a heavy load than wire mesh, which is more likely to give at stress points, especially if too much weight is put on one or two wires instead of being evenly distributed across the majority of the wire mesh. With this characteristic, it is important to note that the actual tensile strength of the steel wire mesh or sheet metal fabrication will be heavily influenced by the type of steel used for the basket. In general, when creating custom industrial baskets for parts cleaning or finishing, and need such parts to be held in place without moving at all, you will need the basket to conform as closely to the shape of those parts as possible. With wire mesh baskets, creating a custom shape to hold the parts exactly is easier than it is with a sheet metal fabrication. Each wire can be bent to nearly any conceivable angle to accommodate specialty parts perfectly. Sheet metal baskets, being made from thicker, more solid pieces of metal, are more difficult to contour perfectly to a custom shape. So, When ARE Wire Mesh Baskets Best? You need a basket to conform perfectly to the shape of a part. Your basket needs the solution being applied to reach the part easily. You need solutions and runoff to drain away as completely as possible. Your parts loads are relatively lightweight. Vapor degreasing baskets (to allow runoff to drain away). Of course, sheet metal and steel wire mesh don’t have to be mutually exclusive in a top-quality custom stainless steel basket. 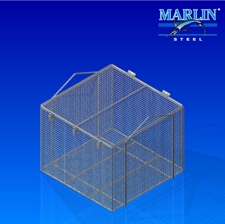 In many of Marlin’s past custom basket designs, both sheet metal and wire mesh have been used in conjunction to create the best basket for the job. In many cases, it has been found necessary to add sheet metal reinforcements to a design in order to give it the ability to hold more weight and be more stable than it would be with thin wire mesh alone. Each time a Marlin Steel engineer works on a basket design for a client, they look for ways to improve the design of that basket. To take the basic design and make it more cost-effective, more durable, or easier for the client to handle. Each iteration of each design is tested using virtual simulations in our AUTODesk software, where potential design flaws are revealed and then corrected. Get the expert advice you need for your next parts washing or finishing basket from experienced and degreed mechanical engineers today!